Torticollis is a twisted neck in which the head is tipped to one side, while the chin is turned to the other.It is a stiff neck associated with muscle spasm, classically causing lateral flexion contracture of the cervical spine musculature. The muscles affected are principally those supplied by the spinal accessory nerve. Fixed Torticollis: Fixed torticollis is also called acute torticollis or permanent torticollis. It is usually due to a problem with muscle or bone structure. This is a congenital form of wry neck. It occurs when the bones in an infant’s neck have formed incorrectly. Children born with this condition may have difficulty with hearing and vision. This rare disorder is sometimes referred to as spasmodic torticollis. It causes neck muscles to contract in spasms. If you have cervical dystonia, your head twists or turns painfully to one side. It may also tilt forward or backward. Cervical dystonia sometimes goes away without treatment. However, there is a risk of recurrence. This type of wry neck or Torticollis can happen to anyone. However, it is most commonly diagnosed in middle age. It affects more women than men. Torticollis can be inherited. It can also develop in the womb. This may happen if the fetus’ head is in the wrong position. It can also be caused by damage to the muscles or blood supply to the neck. Evaluation by an ophthalmologist should be considered in children to ensure that the torticollis is not caused by vision problems (IV cranial nerve palsy, nystagmus-associated “null position,” etc.). Most cases in infants respond well to physical therapy. Other causes should be treated as noted above. †An Osteopathic Physician (D.O.) may choose to use Cranial techniques to properly position the occipital condyles – thereby relieving compression of cranial nerve XI in children with Torticollis. This is an example of Osteopathic Manipulative Treatment. Acquired torticollis occurs because of another problem and usually presents in previously normal children and adults…..
*A self-limiting spontaneously occurring form of torticollis with one or more painful neck muscles is by far the most common (‘stiff neck’) and will pass spontaneously in 1–4 weeks. Usually the sternocleidomastoid muscle or the trapezius muscle is involved. Sometimes draughts, colds or unusual postures are implicated; however in many cases no clear cause is found. These episodes are rarely seen by doctors other than a family physician. *Trauma to the neck can cause atlantoaxial rotatory subluxation, in which the two vertebrae closest to the skull slide with respect to each other, tearing stabilizing ligaments; this condition is treated with traction to reduce the subluxation, followed by bracing or casting until the ligamentous injury heals. *Tumors of the skull base (posterior fossa tumors) can compress the nerve supply to the neck and cause torticollis, and these problems must be treated surgically. *Infections in the posterior pharynx can irritate the nerves supplying the neck muscles and cause torticollis, and these infections may be treated with antibiotics if they are not too severe, but could require surgical debridement in intractable cases. *Ear infections and surgical removal of the adenoids can cause an entity known as Grisel’s syndrome, a subluxation of the upper cervical joints, mostly the atlantoaxial joint, due to inflammatory laxity of the ligaments caused by an infection. This bridge must either be broken through manipulation of the neck, or surgically resected. *The use of certain drugs, such as antipsychotics, can cause torticollis. TREATMENT: Botulinum toxin has been used to inhibit the spastic contractions of the affected muscles. The condition can also occur in animals, usually as a result of an inner ear infection but sometimes as a result of an injury. It is seen largely in domestic rodents and rabbits, but may also appear in dogs and other different animals. The condition may be easier to correct in infants and children. If the condition becomes chronic, numbness and tingling may develop as nerve roots become compressed in the neck. Botulinum toxin injections often provide substantial relief. This entry was posted in Ailmemts & Remedies, Pediatric and tagged Avian influenza, Cancer, Centers for Disease Control and Prevention, Cervical cancer, Chicken, Chief Veterinary Officer (United Kingdom), CNN, Conditions and Diseases, Daddy Potts, Dr. John, Emera, Health, Human papillomavirus, Iowa, Movement Disorders, Muscle, Musculoskeletal Disorders, Neurological Disorders, Pap test, Plea, Prison, Respiratory disease, The Million Women Study, Torticollis, Tumor, United States, United States Department of Agriculture on July 31, 2011 by Mukul. Q: My daughter is two years old and very thin. She is picky about her food and I feel she does not eat enough. Her weight is only 9kg. Is it a good idea to give her appetite stimulating tonics? A: Normally, a child weighs triple its birth weight at the end of the first year and adds 2kg the next year. So your daughter may be in the normal range. It is better to try to discover why she does not eat and treat the cause rather than use tonics. Appetite stimulants can have severe side effects. Some of them contain large amounts of iodine, steroids or cyproheptadine (a banned chemical). They are best avoided. What you can do is reduce her milk intake to 400ml a day. Give half after breakfast and the rest at tea time. Figure out what she likes to eat. Also, get her dewormed; your paediatrician will tell you how. And remember, some children are just difficult when it comes to food. Q: I get sudden painful spasms in my fingers and toes, especially at night. I am 34 years old. A: Calcium deficiency can cause this. If you are not on calcium supplements, starting them may help. Consult a physician to help with the diagnosis and dosage of calcium. Q: Is there a natural way to reduce blood pressure? Currently I am on a lot of medication for it. A: You can reduce your dependence on tablets by achieving ideal body weight (height in metre squared multiplied by 23), walking an hour a day, reducing salt intake to 2.5gm a day, avoiding salted snacks, sleeping at regular hours and reducing stress with yoga and meditation. Q: My son is one and a half years old and has had fits twice. The doctor says it is “fever fits”. I am worried that he may become epileptic. What is a fever fit? A: A febrile seizure (fever fit) usually occurs in children under the age of 5 during an episode of fever. Only one third of the affected children have a second seizure. A certain percentage of children will develop epilepsy but the incidence is not greater in those who have had febrile seizures. Also, these children do not develop mental retardation nor is their intelligence affected. But a febrile fit can be frightening to watch. To prevent such seizures, fever has to be tackled immediately. Buy a digital thermometer and check the temperature by placing it in the child’s armpit (remember, your hand is not a thermometer). If the temperature is greater than 100°F, give the child 10mg/kg of paracetemol. Remove the child’s clothes and sponge him down with tap water. Turn the fan on full speed. After four hours check the temperature again. If it has risen, repeat the above process. Contact your doctor. Q: I have cracked feet. Not only does it look ugly, when water enters the cracks they become painful and inflamed. A: You could try soaking your feet in hot water to which rock salt and liquid soap have been added. After 10 minutes, scrub the foot gently with a small plastic brush. Then apply baby oil. After a few weeks, you will see a vast improvement. This entry was posted in Health Problems & Solutions and tagged Child, Child Health, Conditions and Diseases, Febrile seizure, Fever, Health, Neurological Disorders, Pediatric on July 27, 2011 by Mukul. Neurofibromatosis (commonly abbreviated NF; neurofibromatosis type 1 is also known as von Recklinghausen disease) is a genetically-inherited disorder in which the nerve tissue grows tumors (i.e., neurofibromas) that may be benign or may cause serious damage by compressing nerves and other tissues. The disorder affects all neural crest cells (Schwann cells, melanocytes and endoneurial fibroblasts). Cellular elements from these cell types proliferate excessively throughout the body, forming tumors; melanocytes also function abnormally in this disease, resulting in disordered skin pigmentation and “cafe-au-lait” spots. The tumors may cause bumps under the skin, colored spots, skeletal problems, pressure on spinal nerve roots, and other neurological problems. Neurofibromatosis is an autosomal dominant disorder, which means only one copy of the affected gene is needed for the disorder to develop. Therefore, if only one parent has neurofibromatosis, his or her children have a 50% chance of developing the condition as well. The severity in affected individuals can vary, this may be due to variable expressivity. Approximately half of cases are due to de novo mutations and no other affected family members are seen. It affects males and females equally. Plexiform neurofibroma on the neck of a patient; plexiform neurofibromas are a cause of morbidity in the affected individuals. Patient with multiple small cutaneous neurofibromas and a ‘café au lait spot’ (bottom of photo, to the right of centre). A biopsy has been taken of one of the lesions. *Two or more neurofibromas on or under the skin, or one plexiform neurofibroma (a large cluster of tumors involving multiple nerves); neurofibromas are the subcutaneous bumps characteristic of the disease, and increase in number with age. *Freckling of the groin or the axilla (arm pit). 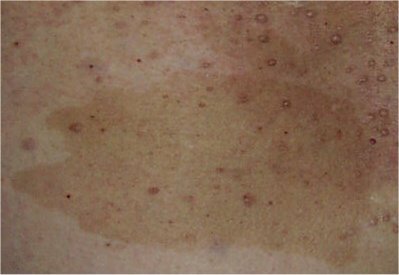 *Café au lait spots (pigmented, light brown macules located on nerves, with smooth edged, “coast of California” birthmarks). *Six or more measuring 5 mm in greatest diameter in prepubertal individuals and over 15 mm in greatest diameter in postpubertal individuals. NF 1 also increases the risk of tumor development, particularly, meningiomas, gliomas and pheochromocytomas. *bilateral acoustic neuromas (tumors of the vestibulocochlear nerve or cranial nerve 8 (CN VIII) also known as schwannoma), often leading to hearing loss. In fact, the hallmark of NF 2 is hearing loss due to acoustic neuromas around the age of twenty. …#patients with NF2 may also develop other brain tumors, as well as spinal tumors. 2.The schwannomas develop on cranial, spinal and peripheral nerves. 4.About 1/3 of patients have segmental schwannomatosis, which means the schwannomas are limited to a single part of the body, such as an arm, a leg or the spine. 5.Unlike the other forms of NF, the schwannomas do not develop on vestibular nerves, and as a result, no loss of hearing is associated with schwannomatosis. 6.Patients with schwannomatosis do not have learning disabilities related to the disorder. One must keep in mind, however, that neurofibromatosis can occur in or affect any of the organ systems, whether that entails simply compressing them (from tumor growth) or in fact altering the organs in some fundamental way. This disparity in the disorder is one of many factors that makes it difficult to diagnose, and eventually find a prognosis for. What causes neurofibromatosis has yet to be fully explained, but it appears to be mostly due to genetic defects (mutations) that either are passed on by a parent or occur spontaneously at conception. Each form of neurofibromatosis is caused by mutations in different genes. The NF1 gene is located on chromosome 17. Normally, this gene produces a protein called neurofibromin, which is abundant in nervous system tissue and helps regulate cell growth. A mutation of the NF1 gene causes a loss of neurofibromin, which allows cells to grow uncontrolled. This results in the tumors characteristic of NF1. A similar problem occurs with NF2. The NF2 gene is located on chromosome 22, which produces a protein called merlin. A mutation of the NF2 gene causes loss of merlin, which also leads to uncontrolled cell growth. Because schwannomatosis has only recently been identified as a separate type of neurofibromatosis, its exact cause is still under scrutiny. In a small number of familial cases, it’s been associated with a mutation of the SMARCB1/INI1 gene, but in most cases the cause is unknown. The occurrence of schwannomatosis is more spontaneous (sporadic) than inherited. The biggest risk factor for neurofibromatosis is a family history of the disorder. About half of NF1 and NF2 cases are inherited. The remaining cases result from spontaneous mutations that occur at conception. The inheritance pattern for schwannomatosis is less clear. Researchers currently estimate that the risk of inheriting schwannomatosis from an affected parent is around 15 percent. Complications of neurofibromatosis vary, even within the same family. Generally, complications result from tumor growth distorting nerve tissue or pressing on internal organs. It’s not possible to predict how the disease will progress in any one individual but most people with neurofibromatosis experience a mild or moderate form of the disorder, regardless of type. Usually, serious complications develop prior to adolescence. *Neurological problems. Learning difficulties occur in up to 60 percent of NF1 cases and are the most common neurological problem associated with NF1. Uncommon neurological complications associated with NF1 include epilepsy, stroke and buildup of excess fluid in the brain (hydrocephalus). *Concerns with appearance. Visible signs of neurofibromatosis — such as extensive cafe au lait spots, nerve tumors (neurofibromas) in the facial area or large neurofibromas — can cause anxiety and emotional distress, even if not medically serious. *Skeletal problems. Some children have abnormally formed bones, which can result in curvature of the spine (scoliosis) and bowed legs. NF1 is also associated with decreased bone mineral density, which increases your risk of weak bones (osteoporosis). *Visual difficulties. Occasionally in children, a tumor growing on the nerve leading from the eye to the brain (optic nerve) can cause visual problems. * Increase in neurofibromas. Hormonal changes associated with puberty, pregnancy or menopause may cause an increase in neurofibromas. Most women with NF1 have healthy pregnancies but will likely need to be monitored by an obstetrician familiar with NF1, in addition to her NF1 specialist. *Cardiovascular problems. People with NF1 have an increased risk of high blood pressure and, rarely, blood vessel abnormalities. *Cancer. Less than 10 percent of people with NF1 develop cancerous (malignant) tumors. These usually arise from neurofibromas under the skin or plexiform neurofibromas involving multiple nerves. Monitor neurofibromas vigilantly for any change in appearance, size or number. Changes may indicate cancerous growth. The earlier a malignancy is detected, the better the chances for effective treatment. People with NF1 also have a higher risk of other forms of cancer, such as breast cancer, leukemia, brain tumors and some types of soft tissue cancer. The pain caused by schwannomatosis can be debilitating and may require surgical treatment or management by a pain specialist. For embryos produced via in vitro fertilisation, it is possible via preimplantation genetic diagnosis (PGD) to screen for NF-1. PGD can not be used to detect Schwannomatosis?, because the gene for it has not yet been identified. *To detect Neurofibromatosis type I?. *To detect Neurofibromatosis type II? with 95% accuracy. *Can not be used to detect Schwannomatosis?, because the gene for it has not yet been identified. Neurofibromatosis type 1 is caused by mutation on chromosome 17q11.2 , the gene product being neurofibromin (a regulator of the GTPase activating enzyme (GAP)). Neurofibromatosis type 2 is due to mutation on chromosome 22q, the gene product is merlin, a cytoskeletal protein. Both NF-1 and NF-2 are autosomal dominant disorders, meaning only one copy of the mutated gene need be inherited to pass the disorder. A child of a parent with NF-1 or NF-2 and an unaffected parent will have a 50%-100% chance of inheriting the disorder, depending on whether the affected parent is heterozygous (Aa) or homozygous (AA) for the trait (“A” depicts the affected dominant allele, while “a” depics the recessive allele). Complicating the question of heritability is the distinction between genotype and phenotype, that is, between the genetics and the actual manifestation of the disorder. In the case of NF1, no clear links between genotype and phenotype have been found, and the severity and the specific nature of the symptoms may vary widely among family members with the disorder. This is a good example of the phenomenon of variable expressivity: the differing severities of disease in different individuals with the same genotype. In the case of NF-2, however, manifestations are similar among family members; a strong genotype-phenotype correlation is believed to exist. Both NF-1 and NF-2 can also appear to be spontaneous de novo mutations, with no family history. These cases account for about one half of neurofibromatosis cases. Similar to polydactyly, NF is also a autosomally dominant mutation, that is not prevalent in the society. Neurofibromatosis-1 is found in approximately 1 in 2,500-3,000 live births (carrier incidence 0.0004, gene frequency 0.0002) and is more common than NF-2. There is at present no cure for NF but the Neurofibromatosis Association is optimistic that there will be an effective treatment within the next five to ten years. For families with NF, genetic screening and counselling is available. Most people don’t need any treatment but surgery may be necessary to remove some tumours (such as acoustic neuromas or brain tumours) and this can cause complications such as facial paralysis. Treatment for complications such as epilepsy is given as appropriate. Vision and hearing are regularly tested. Special education is provided for those children with learning difficulties. This entry was posted in Ailmemts & Remedies and tagged Café au lait spot, Conditions and Diseases, Genetic disorder, Health, Neurofibromatosis, Neurofibromatosis type I, Neurological Disorders, Peripheral nervous system on July 22, 2011 by Mukul. Myoclonus refers to a sudden, involuntary jerking of a muscle or group of muscles. In its simplest form, myoclonus consists of a muscle twitch followed by relaxation. A hiccup is an example of this type of myoclonus. Other familiar examples of myoclonus are the jerks or “sleep starts” that some people experience while drifting off to sleep. These simple forms of myoclonus occur in normal, healthy persons and cause no difficulties. When more widespread, myoclonus may involve persistent, shock-like contractions in a group of muscles. Myoclonic jerking may develop in people with multiple sclerosis, Parkinson’s disease, Alzheimer’s disease, or Creutzfeldt-Jakob disease. Myoclonic jerks commonly occur in persons with epilepsy, a disorder in which the electrical activity in the brain becomes disordered and leads to seizures. Myoclonus may develop in response to infection, head or spinal cord injury, stroke, brain tumors, kidney or liver failure, lipid storage disease, chemical or drug poisoning, or other disorders. It can occur by itself, but most often it is one of several symptoms associated with a wide variety of nervous system disorders. Myoclonic jerks may occur alone or in sequence, in a pattern or without pattern. They may occur infrequently or many times each minute. Most often, myoclonus is one of several signs in a wide variety of nervous system disorders such as multiple sclerosis, Parkinson’s disease, Alzheimer’s disease, subacute sclerosing panencephalitis and Creutzfeldt-Jakob disease (CJD), serotonin toxicity, and some forms of epilepsy. Some researchers indicate that jerks persistently may even cause early tremors. Progressive myoclonic epilepsy includes both myoclonic and tonic-clonic seizures. Treatment is not normally successful for any extended period of time. *Action myoclonus is characterized by muscular jerking triggered or intensified by voluntary movement or even the intention to move. It may be made worse by attempts at precise, coordinated movements. Action myoclonus is the most disabling form of myoclonus and can affect the arms, legs, face, and even the voice. This type of myoclonus often is caused by brain damage that results from a lack of oxygen and blood flow to the brain when breathing or heartbeat is temporarily stopped. *Cortical reflex myoclonus is thought to be a type of epilepsy that originates in the cerebral cortex – the outer layer, or “gray matter,” of the brain, responsible for much of the information processing that takes place in the brain. In this type of myoclonus, jerks usually involve only a few muscles in one part of the body, but jerks involving many muscles also may occur. Cortical reflex myoclonus can be intensified when patients attempt to move in a certain way or perceive a particular sensation. *Essential myoclonus occurs in the absence of epilepsy or other apparent abnormalities in the brain or nerves. It can occur randomly in people with no family history, but it also can appear among members of the same family, indicating that it sometimes may be an inherited disorder. Essential myoclonus tends to be stable without increasing in severity over time. Some scientists speculate that some forms of essential myoclonus may be a type of epilepsy with no known cause. *Palatal myoclonus is a regular, rhythmic contraction of one or both sides of the rear of the roof of the mouth, called the soft palate. These contractions may be accompanied by myoclonus in other muscles, including those in the face, tongue, throat, and diaphragm. The contractions are very rapid, occurring as often as 150 times a minute, and may persist during sleep. The condition usually appears in adults and can last indefinitely. People with palatal myoclonus usually regard it as a minor problem, although some occasionally complain of a “clicking” sound in the ear, a noise made as the muscles in the soft palate contract. *Progressive myoclonus epilepsy (PME) is a group of diseases characterized by myoclonus, epileptic seizures, and other serious symptoms such as trouble walking or speaking. These rare disorders often get worse over time and sometimes are fatal. Studies have identified at least three forms of PME. Lafora disease is inherited as an autosomal recessive disorder, meaning that the disease occurs only when a child inherits two copies of a defective gene, one from each parent. Lafora disease is characterized by myoclonus, epileptic seizures, and dementia (progressive loss of memory and other intellectual functions). A second group of PME diseases belonging to the class of cerebral storage diseases usually involves myoclonus, visual problems, dementia, and dystonia (sustained muscle contractions that cause twisting movements or abnormal postures). Another group of PME disorders in the class of system degenerations often is accompanied by action myoclonus, seizures, and problems with balance and walking. Many of these PME diseases begin in childhood or adolescence. *Reticular reflex myoclonus is thought to be a type of generalized epilepsy that originates in the brainstem, the part of the brain that connects to the spinal cord and controls vital functions such as breathing and heartbeat. Myoclonic jerks usually affect the whole body, with muscles on both sides of the body affected simultaneously. In some people, myoclonic jerks occur in only a part of the body, such as the legs, with all the muscles in that part being involved in each jerk. Reticular reflex myoclonus can be triggered by either a voluntary movement or an external stimulus. *Spinal myoclonus is myoclonus originating in the spinal cord, including segmental and propriospinal myoclonus. The latter is usually due to a thoracic generator producing truncal flexion jerk. It is often stimulus-induced with a delay due to the slow conducting propriospinal nerve fibers. *Stimulus-sensitive myoclonus is triggered by a variety of external events, including noise, movement, and light. Surprise may increase the sensitivity of the patient. *Sleep myoclonus occurs during the initial phases of sleep, especially at the moment of dropping off to sleep. Some forms appear to be stimulus-sensitive. Some persons with sleep myoclonus are rarely troubled by, or need treatment for, the condition. However, myoclonus may be a symptom in more complex and disturbing sleep disorders, such as restless legs syndrome, and may require treatment by a doctor. Myoclonic seizures can be described as “jumps.” They are caused by rapid contraction and relaxation of the muscles. People without epilepsy can suffer small but similar jerks in the form of hiccups or brief twitches. These are perfectly normal. In someone with epilepsy, myoclonic seizures cause abnormal movements on both sides of the body at the same time. In reflex epilepsies, myoclonic seizures can be brought on by flashing lights or other environmental triggers (see photosensitive epilepsy). Familiar examples of normal myoclonus include hiccups and hypnic jerks that some people experience while drifting off to sleep. Severe cases of pathologic myoclonus can distort movement and severely limit a person’s ability to sleep, eat, talk, and walk. Myoclonic jerks commonly occur in individuals with epilepsy. The most common types of myoclonus include action, cortical reflex, essential, palatal, progressive myoclonus epilepsy, reticular reflex, sleep, and stimulus-sensitive. Essential myoclonus occurs on its own, typically without other symptoms and without being related to any underlying illness. The cause of essential myoclonus is often unexplained (idiopathic) or, in some cases, hereditary. This type of myoclonus occurs as part of an epileptic disorder. Muscle jerks may be the only symptom or one of many. Discontinuation of drugs suspected of causing myoclonus and treatment of metabolic derangements may resolve some cases of myoclonus. When pharmacological treatment is indicated anticonvulsants are the main line of treatment. Paradoxical reactions to treatment are notable. Drugs which most people respond to may in other individuals worsen their symptoms. Sometimes this leads to the mistake of increasing the dose, rather than decreasing or stopping the drug. Treatment of myoclonus focuses on medications that may help reduce symptoms. Drugs used include sodium valproate, clonazepam and some other anticonvulsants such as piracetam and levetiracetam. Dosages of clonazepam usually are increased gradually until the patient improves or side effects become harmful. Drowsiness and loss of coordination are common side effects. The beneficial effects of clonazepam may diminish over time if the patient develops a tolerance to the drug. Some studies have shown that doses of 5-hydroxytryptophan (5-HTP) leads to improvement in patients with some types of action myoclonus and PME. These differences in the effect of 5-HTP on patients with myoclonus have not yet been explained, but they may offer important clues to underlying abnormalities in serotonin receptors. Although myoclonus is not a life-threatening condition, it may result in serious, debilitating impairments. Action myoclonus, with its positive and negative myoclonus components, is generally considered the most serious. It varies from person to person as to whether it is life-long. The National Institute of Neurological Disorders and Stroke (NINDS) conducts research relating to myoclonus in its laboratories at the National Institutes of Health (NIH) and also supports additional research through grants to major medical institutions across the country. Scientists are seeking to understand the underlying biochemical basis of involuntary movements and to find the most effective treatment for myoclonus and other movement disorders. Researchers may be able to develop drug treatments that target specific biochemical changes involved in myoclonus. By combining several of these drugs, scientists hope to achieve greater control of myoclonic symptoms. This entry was posted in Ailmemts & Remedies and tagged Alzheimer's disease, Conditions and Diseases, Electroencephalography, Epileptic seizure, Health, Myoclonus, Neurological Disorders, Parkinson's disease on July 9, 2011 by Mukul.